The Reverend Dr. Cassandra Gould is a pastor and an activist whose ministry and community work is rooted in the biblical mandate for justice. She is the Executive Director of Missouri Faith Voices and the pastor of Quinn Chapel A.M.E. Church in Jefferson City, MO. 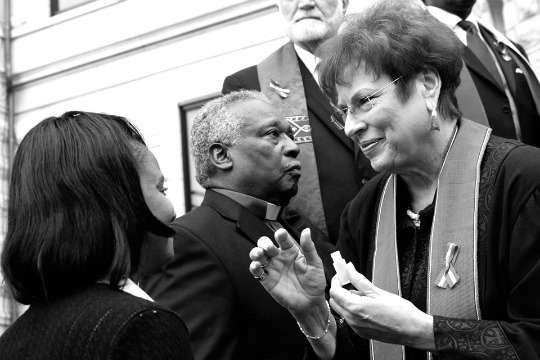 A native of Demopolis, Alabama, she is an ordained elder in the African Methodist Episcopal Church. Her undergraduate work includes psychology and journalism. Reverend Dr. Gould holds an M. Div from Eden Seminary and a Doctorate of Ministry from United Theological Seminary. She lives out her D.Min project “Beyond The Walls: The Power of Prophetic Preaching.” Justice and community engagement is the hallmark of the ministry at Quinn Chapel. 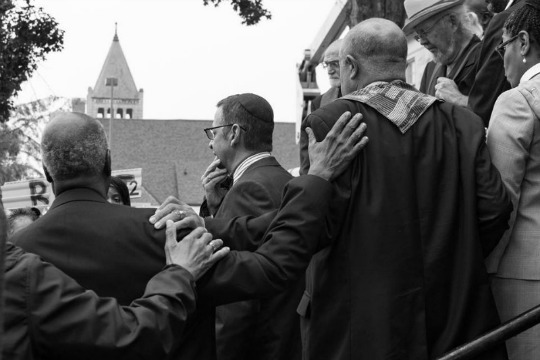 Dr. Gould’s role as a public theologian has helped to shape a culture of advocacy and justice for the church and the Jefferson City community. Dr. Gould is a sought after preacher, teacher and prophetic voice. She is often quoted in the media as one who speaks truth to power regarding various injustices. As a pastor in the State Capitol she is a go to person for testimony against unjust legislation and in support of legislation designed to empower and improve the lives of people in her state and across the country. She can be found on the front lines fighting for justice from Ferguson to the D.C. 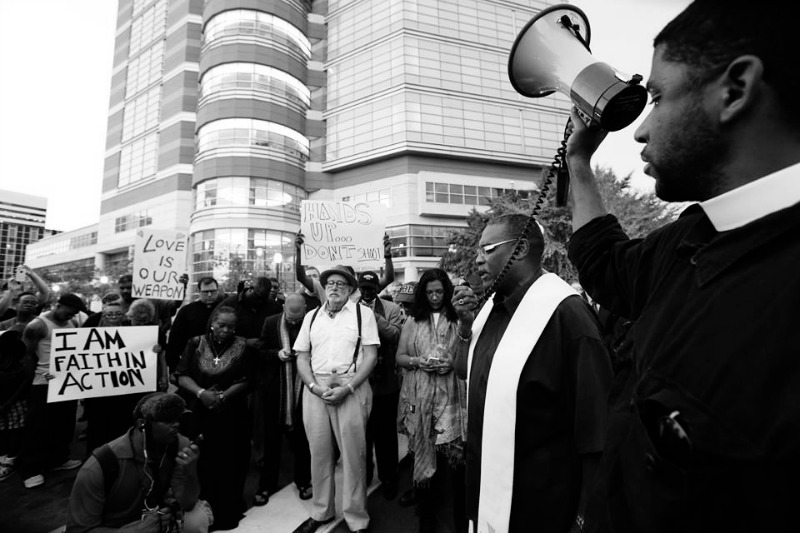 There are myriad of social justice issues that call her to put her faith on the line. Her advocacy for families caught in the debt trap caused by financial predation has garnered national attention. She was a panelist in the public hearing held by the Consumer Financial Protection Bureau last year in which the rules to regulate payday lending and small dollar loans were released. Her leadership initially as a board member and now as Executive Director has raised our visibility and grown our organization. Missouri Faith Voices is the only statewide faith based grassroots organization dedicated to racial equity in the State. Dr. Gould also serves as the faith co-chair for the state wide Jobs With Justice Board and the Religious Affairs and Political Action Director of the Missouri State NAACP. She is the Social Action Chair for the Jefferson City Alumnae Chapter of Delta Sigma Theta Sorority, Inc.
A native of California, Alice brings seven years of community organizing experience to Missouri Faith Voices. Alice graduated from the University of California, Berkeley with a degree in Development Studies. Moved by experiences in post-Katrina New Orleans, she committed to community organizing as a profession to dismantle racist and oppressive systems and bring people directly impacted by them to the public decision-making table. Alice has worked in labor organizing to develop public sector workers to lead campaigns for workplace dignity and safety. She has been engaged in faith-based organizing for the last five years: working on campaigns for economic dignity in Missouri and developing leaders in more suburban geographies. As lead organizer for Missouri Faith Voices, Alice looks forward to developing and aligning the power of people of faith across race, place, and politics in Missouri to put our families at the heart of decision-making. Susan Schmalzbauer serves as Congregational Coordinator for Faith Voices of Southwest Missouri. Born in Winslow, Arizona, Susan grew up in the Mennonite community of Newton, Kansas. During her undergraduate years at Bethel College (Kansas) and Wheaton College (Illinois), she was active in a variety of faith and social justice organizations. Earning a master’s degree in rehabilitation of the blind from the University of Arkansas at Little Rock, Susan worked as an orientation and mobility instructor at the Lighthouse, Inc. in New York City. The mother of three boys, she fought for inclusion when her special needs child enrolled in the public schools. After moving to the Ozarks, Susan became active in Faith Voices of Southwest Missouri. 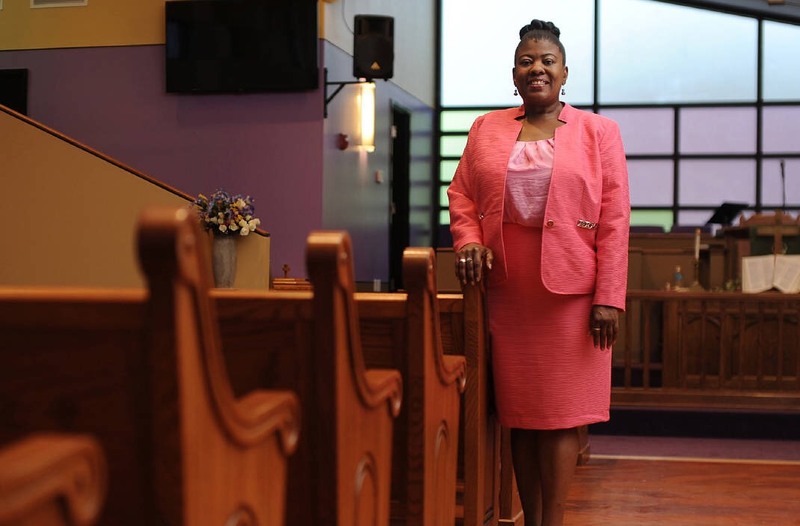 A member of Springfield’s Campbell United Methodist Church, she grounds her activism in Micah 6:8 (“What does the Lord require of you but to do justice, and to love kindness, and to walk humbly with your God?”). Antona Brent Smith, M.B.A. is a writer, thinker, speaker, and teacher who places a lot of her social justice efforts in advancing the cause of equitable and accessible educational opportunities for Black children. She was raised in Jefferson City and Benton Harbor, Michigan. Antona is the daughter of a theologian and has chosen to follow in her late father’s footsteps, currently pursuing her Master of Divinity from Eden Theological Studies with an emphasis in Womanist Theology and African American Literature. Antona is the founding director and leader of a summer teen reading program, The Hurston & Hughes Literary Circle, advocating Afrodisporan teens to read collaboratively in understanding their history and crafting their own narrative. She resides in Kirkwood with her husband, Dr. Dwyane Smith, Provost of Harris-Stowe State University, and her daughters, the youngest two of six children. Antona enjoys reading women-focused literature, a well-made latte, and any lake she can find. Click here to get involved in our work.